If you want to learn Chinese like me and if you have a smartphone, then you have certainly turned up to the Play Store in search of good apps that will help you in learning Chinese. There are several of those there but the best one which I found is called Pleco. Pleco is a Chinese Dictionary app and it is available for Android as well as iOS. After installing this free app, you will find several of its features quite useful. In the search input box of the app, you can enter an English word and it will give several Chinese translations in pinyin for it immediately. There are around 130,000 definitions of Chinese words in the free dictionary. The dictionary also provides you example sentences both in Chinese and English. Searching by typing from your smartphone keyboard is not the only feature that this app provides. You can also search for definitions of Chinese characters, if you know Chinese characters that is. 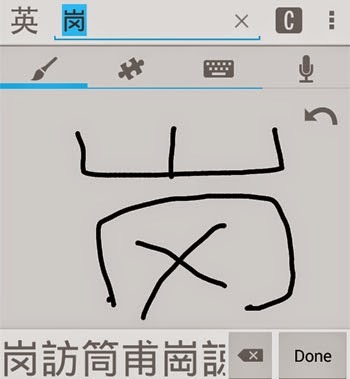 In the "Handwriting Recognizer" feature of the app, you can draw the Chinese characters with your fingers on the screen. The matching Chinese characters will be displayed below. Click on them and click on done to search for their meaning. This comes quite in handy, if you are trying to write with Hanji (Chinese characters) and you are not sure about the exact symbol. Searching and translating words is not the only feature that this app boasts. There are add-ons (free as well as paid) which allow you to add different features to Pleco. The above mentioned add-ons installs dictionary words database with tons of new words in different languages to Pleco. The Audio Pronunciation add-on is the most useful one. After you add it, you will be able to learn the pronunciation of the searched words in the app. Audio for the pronunciation of the Chinese words will be available which teaches you the correct way to say words. Besides adding new dictionary and advanced words to Pleco, the paid addons can allow Pleco to read chinese characters. This is known as the OCR (Optical Character Recognizer) feature and you can easily make your smartphone read and identify Chinese characters with the camera. The other interesting add-on is the text file reader which allows you to instantly look up characters in text files. Stroke Order Diagrams teaches you how to draw the Chinese Hanji characters correctly, stroke by stroke, in the right order. The paid add-ons can also be purchased in bundles which saves cost but only choose this option if you are serious about getting and using the features provided by those addons. Overall, this is a great app for Chinese learners. Chinese is not an easy language to learn, but with tools like this one learning Chinese can be made simpler. There is no guarantee that you will be an expert in this difficult language after installing this app but it will facilitate your learning experience by a lot.